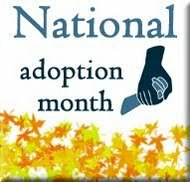 Hooray for National Adoption Month! Adoption has surely blessed our family. We wouldn't be a complete family without it. I'm continuing to keep my fingers crossed for you and Devin. I know something good is around a corner for you. Can't wait.